The Zodiac iCLASS II reader allows for an unlimited number of users as fingerprint templates are stored on the credential & not the reader or system. What better way to increase your security than by ensuring that access cards and tags in your system are being used only by the users to which they were assigned? 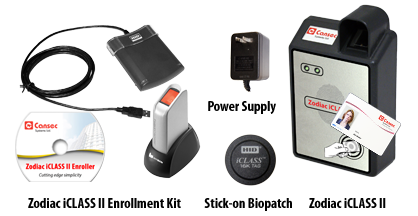 With Zodiac iCLASS II, a user simply presents their 16K bit iCLASS credential to the reader and places their finger on the scanner. The reader compares the live fingerprint scan to the template stored on the credential. If they match, the Wiegand data on the credential is sent to the access control system where it is processed just as if it came from a normal prox reader. The Zodiac iCLASS II reader allows for an unlimited number of users since each user’s fingerprint template is stored on their credential and not the reader or the system. Standard proximity readers can be replaced with Zodiac readers in as little as five minutes without any wiring changes or changes to existing access control panels. 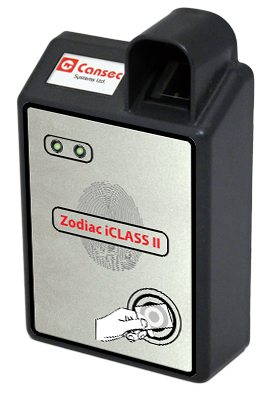 The Zodiac iCLASS II reader can also be used with existing non-iCLASS cards by adding a 16K bit iCLASS stick-on patch onto the existing cards of users requiring access to the biometrically protected area. And best of all, Zodiac iCLASS II works with all Wiegand formats with no special setup or firmware. Upgrade any existing prox reader to biometrics in 5 minutes. Uses existing Wiegand proximity reader wiring. No changes required to the control panel hardware or firmware. Each user’s template is stored in their iCLASS card or patch - reader capacity is unlimited. Two-factor authentication (card+fingerprint) provides the highest level of security. Uses one-to-one verification for instant response regardless of user capacity. Optical sensor is highly vandal resistant. Large sensor size and matching algorithm tolerates a broad range of finger placements. Allows a primary and backup fingerprint to be enrolled for each user. cards. Supports all Wiegand formats. Includes smart card reader/writer, software, desktop fingerprint scanner, logon card. 12V DC 1 Amp plug-in supply provides current for Zodiac iCLASS II reader. Includes plug-in transformer and heater pack. Used when operating temperature is below 32˚F or 0˚C but above -10˚F or -23˚C. For outdoor use. Molded from thick polycarbonate material that is UV-stabilized against discoloration.